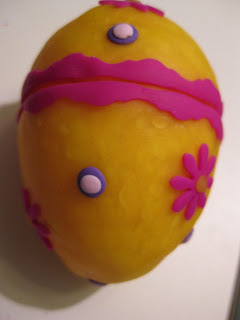 Mega•Crafty: Eggs-periement AKA: Polymer clay Easter eggs. Eggs-periement AKA: Polymer clay Easter eggs. It's been a hectic few weeks here in Megsville! Between work and being waylaid by after-work plans I've barely had time to do the basics around the house (like grocery shop, cook- if we had food, or clean anything) but I have made a little bit of time for some crafting. I picked-up a bag of those cheap-O plastic eggs (the kind that practically everyone has at one time or another) with the idea that I might be able to do something interesting with them. After mulling this over for a day or so I decided to try and cover them with polymer clay. This was a total experiment! I had literally no idea if the plastic would melt in the oven, but I figured that if you can cover a pen with polymer clay and not have the plastic melt, that this was worth a shot. First I used a needle tool to scrape the surface of the plastic. Not having the smooth glossy plastic would, I thought, help the clay stick better. 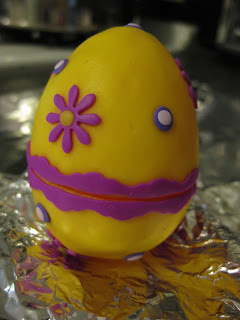 Then I covered the egg- one half at a time. I used the pasta machine to roll the clay out (on about a 5 setting) so I got a nice even surface to start. Since this is well... egg shaped it's a bit odd to cover. I ended up pulling extra clay off in some places and adding more to others. The better conditioned your clay, the better you will be able to hide the seams. 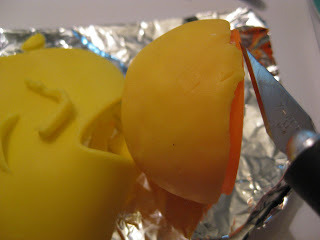 Once I had both the top and the bottom covered in yellow I used my craft knife to carefully trim around the edges where the egg comes together. 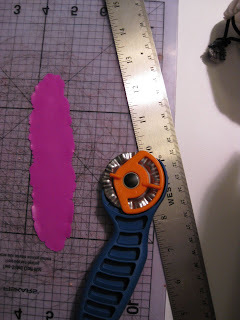 I rolled out some pink (thinner this time, maybe a 3 setting) and used a cutting wheel to cut a strip of clay with a decorative edge. I cut this strip in half with a craft knife and wrapped it around both sides of the egg, (with the straight side matching up against the seam in the middle of the egg). 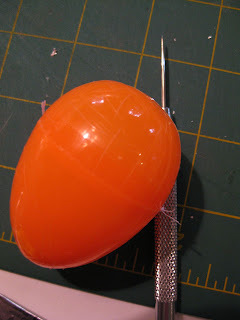 Again I trimmed the edge of each half to be sure the egg would still click back together. 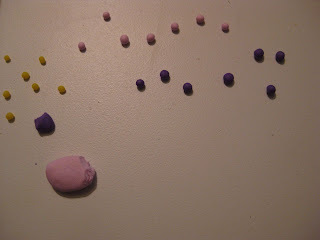 Then I rolled out some balls to make polka dots and made some flowers. Now came the baking- I carefully sealed the egg back together so there wouldn't be any exposed plastic and it went into the oven according to the directions for the clay I used. Since I had no idea what would happen I checked on this every few minutes to be sure it wasn't melting or doing anything else horrible! The results were mixed, the egg retained it's shape- no melting. But the yellow clay got a weird marbled look to it. Light colors might not work on the plastic? The pinks and purples held up fine. 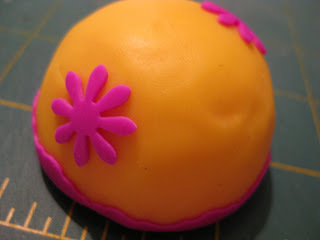 Maybe it was because I used a darker colored plastic egg (orange) under a light color clay? Perhaps I cooked this just a tad too long- I left it in a few minutes longer to account for all the opening of the door to check on it. I decided another test was needed. 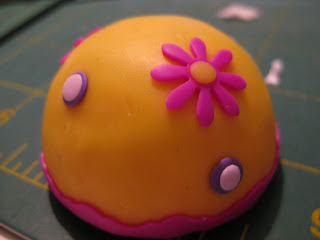 I used scrap clay for this one- so the results aren't that pretty. This time I did a few things differently. I forgot to scratch up the surface. 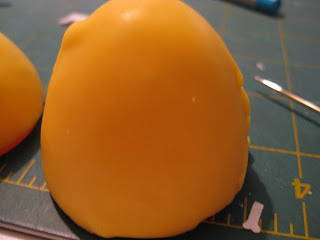 I used a yellow egg under yellow clay, and covered the bottom in a dark color to see if the dark clay still held up better. This time the way the clay looked after baking was much better- I didn't see any difference between the yellow and the purple at all. I'm not really sure why- it could have been the light color plastic under light colored clay (that didn't hurt and I would do that again for sure) or maybe it's the fact that this shade of yellow has a lot more white in it than the other one keeping it more opaque than the brighter shade. Also since I didn't scratch the surface of the plastic I could now easily slide the plastic out from the clay- which could be a happy accident. 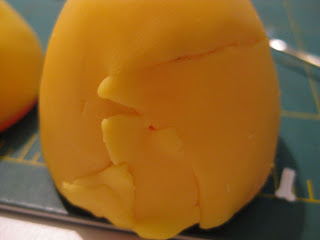 I guess the plastic could be used as a mold, then removed and the two clay only halves of the egg could be sealed together with another piece of clay and baked without the plastic. P.S. I'm going to continue to experiment with this- more to come! If you are going to experiment on your own please use caution this project does involve plastic and heat. Use common sense do not leave this project unattended and experiment at your own risk. Also I baked this in a full sized oven- I've had bad results with other clay projects using smaller clay ovens or toaster ovens, so I don't know if this would hold up in that type of oven or not. Certain pens can withstand the heat probably because they are essentially PVC or the same as polymer clay itself. Most other plastics will melt or distort. I totally agree with experimenting first and not doing too an elaborate of a piece or that 'oh no!' factor sets in. Kinda neat that you were able to slide the polymer off this type of plastic afterward! 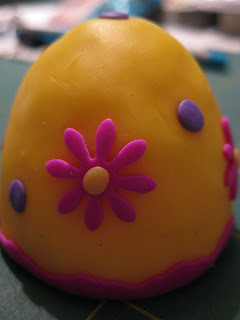 Real eggs can be covered with clay too. Poke holes in both ends and blow the yolk and egg-white out, cover, poke a teeny hole where air can escape while baking and good to go. Am curious about the marbling and crescent placques in the yellow...did it have translucent mixed in it? 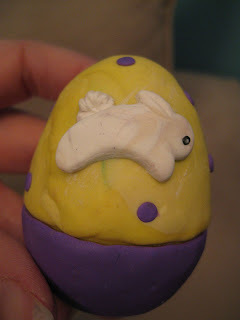 This did hold up well in the oven- and I was pleasantly surprised about being able to slide the egg out from the clay. I might try to bake one that way and see the results. The first yellow did not have translucent clay mixed into it, the marbling is a total mystery to me (especially since the second yellow came out just fine). I also had that thought about the blown eggs but was concerned that the shell might not hold up to the blending needed to get the initial cover on the surface. (I also have to admit that I am one of those people who is all thumbs when it comes to blowing out eggs- never been able to achieve it) If you've tried it I'd love to see some pictures of the results!